I know I promised a new training article two weeks ago but my schedule has been a bit crazy lately. It’s coming, but as it’s been a while since my last post, I thought I’d drop this success story real quick. It’s good that I have a whole bunch of these stacked away for times when my regular posts run far in between. This one is from strength coach and former bodybuilder John O’Brien, who turned 40 this summer. John decided that he didn’t want to enter the big 40 being unsatisfied with his appearance. Guess you could call that a 40-year-old-crisis. And you do know what the best way to solve an age crisis is, right? Show what’s attainable in a relatively short amount of time for people approaching middle-age. That you can get in great shape without feeling deprived or starving yourself. That you never have to spend hours at the gym to reach your goals. John trained 3x/week and only did leisurely walking as “cardio.” This is actually what most of my clients do as well. Turned 40 today and have IF’d for about 10 weeks. This was not a pre-contest diet, I just wanted to get in reasonable shape for my birthday. Only cardio was walking the dog for 45 min every morning at 3 mph. Weight went from 205 to 195, so not a great deal of weight lost, didn’t try to, wanted to recomp. Very easy to get to this point. I think this diet is ideal for those cutting/fat loss. 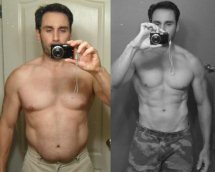 Considering the time, the ease of the diet, and the fact that John added some muscle in the process, I think his results are awesome. Also, note that John had been training regularly before he decided to make an extra effort for his upcoming birthday. This was about fixing his diet and working towards a goal, not starting training from zilch and taking advantage of muscle memory. ‘Discovery’. This was the first thought that came to my mind when I stumbled upon a thread on bodybuilding.com titled “Intermittent fasting for strength training and fat loss” and saw Martin Berkhan. I thought to myself, “he looks too lean, he must be on to something.” I read the thread and then the info on his site Leangains.com and was extremely curious. The next few weeks I cross referenced the facts about intermittent fasting and came to the conclusion, that this theory has scientific validity! Hasta la vista, rolls of back fat. 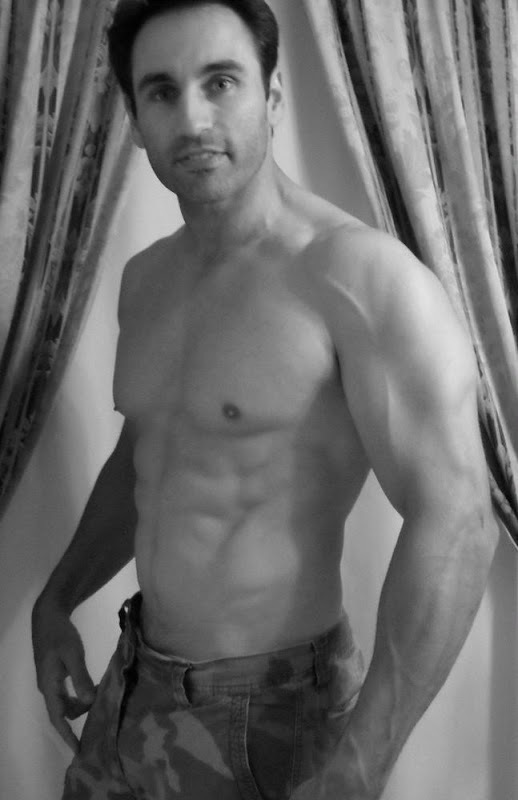 I competed in natural bodybuilding in my late 20’s and have continued to train consistently. My biggest problem was diet. I wouldn’t get overly fat, but not in the shape that I would like to be. My routine would go as follows: eat clean Monday – Friday, then on the weekends cheat and destroy the weeks’ progress. Repeat again and again. Granted this method keeps you from getting out of control, but you take one step forward, one step back weekly. I wanted to end this stalemate once and for all. I decided that I was not going to turn 40 unhappy about my appearance. I decided to shed my long held conventional methods to dieting and submerge myself into the intermittent fasting diet. I was pleasantly surprised that after the first month of this form of eating I didn’t resemble a Kenyan marathon runner and that I actually held onto my muscle mass. John seems to be at least 15-17% body fat in the before-picture and 10% body fat in the after-picture. I just emailed John about strength stats, so I’ll see if I can add them in later. As time went on, my weight and body fat started to come down, slowly but surely. Having done pre-contest dieting in the past, I can easily say this was by far the easiest process ever. I would have my forbidden diet foods (pancakes, cereal, French toast, etc) in the post workout window, therefore not craving them and having insane cheat days. Tremendous improvement, appearance wise. John looks much younger, despite not having lost much weight, relatively speaking. I have adopted intermittent fasting as a way of life. This has been an eye opening experience for me on dieting, especially after already ‘knowing it all.’ I want to thank Martin for his excellent work on this subject and his commitment to sharing his knowledge. Do you have a similar success story to share? Feel free to shoot me an email if you’ve used Leangains to transform your body.